Groundwater is stored in the open spaces within rocks and within unconsolidated sediments. Rocks and sediments near the surface are under less pressure than those at significant depth and therefore tend to have more open space. For this reason, and because it’s expensive to drill deep wells, most of the groundwater that is accessed by individual users is within the first 100 m of the surface. Some municipal, agricultural, and industrial groundwater users get their water from greater depth, but deeper groundwater tends to be of lower quality than shallow groundwater, so there is a limit as to how deep we can go. Porosity is the percentage of open space within an unconsolidated sediment or a rock. Primary porosity is represented by the spaces between grains in a sediment or sedimentary rock. Secondary porosity is porosity that has developed after the rock has formed. It can include fracture porosity — space within fractures in any kind of rock. Some volcanic rock has a special type of porosity related to vesicles, and some limestone has extra porosity related to cavities within fossils. Porosity is expressed as a percentage calculated from the volume of open space in a rock compared with the total volume of rock. 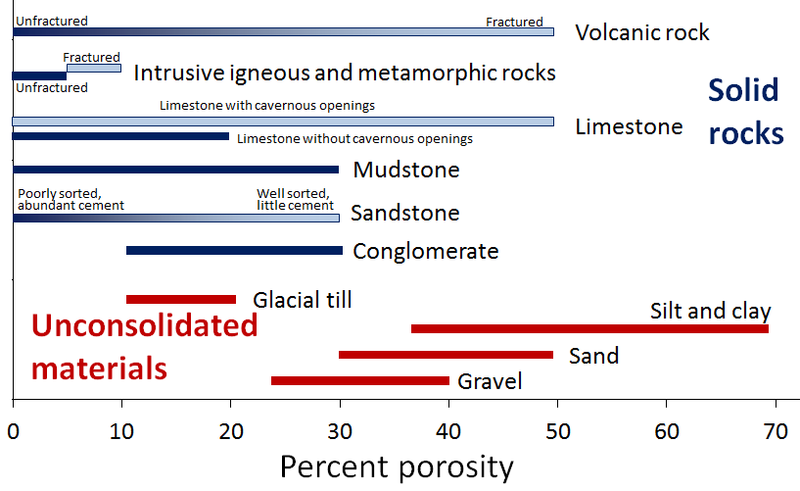 The typical ranges in porosity of a number of different geological materials are shown in Figure 14.2. 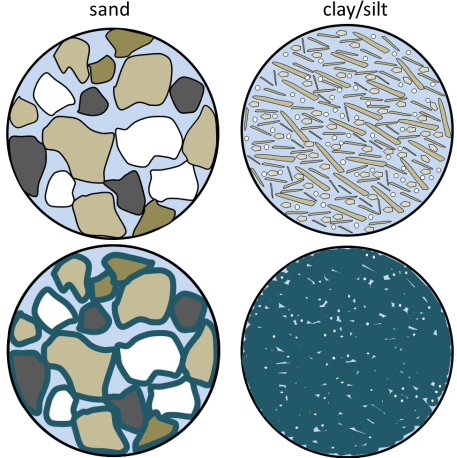 Unconsolidated sediments tend to have higher porosity than consolidated ones because they have no cement, and most have not been strongly compressed. Finer-grained materials (e.g., silt and clay) tend to have greater porosity — some as high as 70% — than coarser materials (e.g., gravel). Primary porosity tends to be higher in well-sorted sediments compared to poorly sorted sediments, where there is a range of smaller particles to fill the spaces made by the larger particles. Glacial till, which has a wide range of grain sizes and is typically formed under compression beneath glacial ice, has relatively low porosity. Consolidation and cementation during the process of lithification of unconsolidated sediments into sedimentary rocks reduces primary porosity. Sedimentary rocks generally have porosities in the range of 10% to 30%, some of which may be secondary (fracture) porosity. The grain size, sorting, compaction, and degree of cementation of the rocks all influence primary porosity. For example, poorly sorted and well-cemented sandstone and well-compressed mudstone can have very low porosity. Igneous or metamorphic rocks have the lowest primary porosity because they commonly form at depth and have interlocking crystals. Most of their porosity comes in the form of secondary porosity in fractures. Of the consolidated rocks, well-fractured volcanic rocks and limestone that has cavernous openings produced by dissolution have the highest potential porosity, while intrusive igneous and metamorphic rocks, which formed under great pressure, have the lowest. Porosity is a measure of how much water can be stored in geological materials. Almost all rocks contain some porosity and therefore contain groundwater. Groundwater is found under your feet and everywhere on the planet. Considering that sedimentary rocks and unconsolidated sediments cover about 75% of the continental crust with an average thickness of a few hundred metres, and that they are likely to have around 20% porosity on average, it is easy to see that a huge volume of water can be stored in the ground. Porosity is a description of how much space there could be to hold water under the ground, and permeability describes how those pores are shaped and interconnected. This determines how easy it is for water to flow from one pore to the next. Larger pores mean there is less friction between flowing water and the sides of the pores. Smaller pores mean more friction along pore walls, but also more twists and turns for the water to have to flow-through. A permeable material has a greater number of larger, well-connected pores spaces, whereas an impermeable material has fewer, smaller pores that are poorly connected. Permeability is the most important variable in groundwater. Permeability describes how easily water can flow through the rock or unconsolidated sediment and how easy it will be to extract the water for our purposes. The characteristic of permeability of a geological material is quantified by geoscientists and engineers using a number of different units, but the most common is the hydraulic conductivity. The symbol used for hydraulic conductivity is K. Although hydraulic conductivity can be expressed in a range of different units, in this book, we will always use m/s. The materials in Figure 14.3 show that there is a wide range of permeability in geological materials from 10-12 m/s (0.000000000001 m/s) to around 1 m/s. 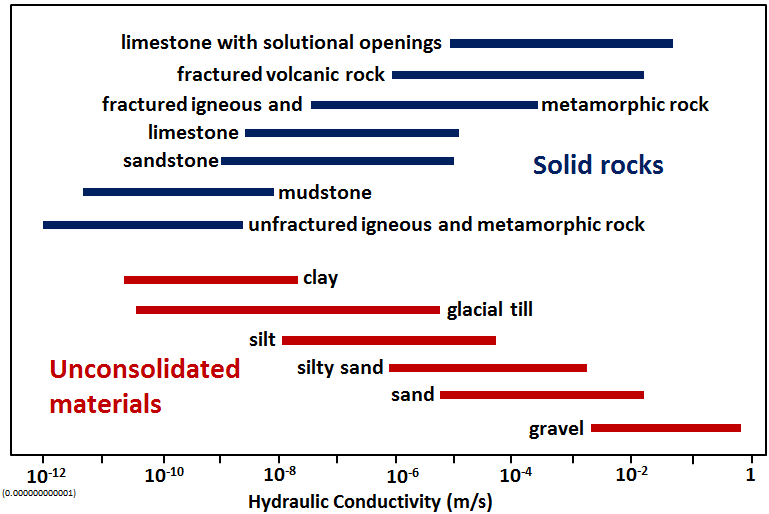 Unconsolidated materials are generally more permeable than the corresponding rocks (compare sand with sandstone, for example), and the coarser materials are much more permeable than the finer ones. The least permeable rocks are unfractured intrusive igneous and metamorphic rocks, followed by unfractured mudstone, sandstone, and limestone. The permeability of sandstone can vary widely depending on the degree of sorting and the amount of cement that is present. Fractured igneous and metamorphic rocks, and especially fractured volcanic rocks, can be highly permeable, as can limestone that has been dissolved along fractures and bedding planes to create solutional openings. Why is clay porous but not permeable? Both sand and clay deposits (and sandstone and mudstone) are quite porous (30% to 50% for sand and 40% to 70% for silt and clay), but while sand can be quite permeable, clay and mudstone are not. We have now seen that there is a wide range of porosity in geological materials and an even wider range of permeability. Groundwater exists everywhere there is porosity. However, whether that groundwater is able to flow in significant quantities depends on the permeability. An aquifer is defined as a body of rock or unconsolidated sediment that has sufficient permeability to allow water to flow through it. Unconsolidated materials like gravel, sand, and even silt make relatively good aquifers, as do rocks like sandstone. Other rocks can be good aquifers if they are well fractured. An aquitard is a body that does not allow transmission of a significant amount of water, such as a clay, a till, or a poorly fractured igneous or metamorphic rock. These are relative terms, not absolute, and are usually defined based on someone’s desire to pump groundwater; what is an aquifer to someone who does not need a lot of water, may be an aquitard to someone else who does. An aquifer that is exposed at the ground surface is called an unconfined aquifer. An aquifer where there is a lower permeability material between the aquifer and the ground surface is known as a confined aquifer, and the aquitard separating ground surface and the aquifer is known as the confining layer. Figure 14.4 shows a cross-section of a series of rocks and unconsolidated materials, some of which might serve as aquifers and others as aquitards or confining layers. The granite is much less permeable than the other materials, and so is an aquitard in this context. The yellow layer is very permeable and would make an ideal aquifer. The overlying grey layer is a confining layer. The upper buff-coloured layer (K = 10-2 m/s) does not have a confining layer and is an unconfined aquifer. The yellow layer (K = 10-1 m/s) is “confined” by the confining layer (K = 10-4 m/s), and is a confined aquifer. The confined aquifer gets most of its water from the upper part of the hill where it is exposed at the surface, and relatively little by seepage through the fine silt layer. 14.1 Groundwater and Aquifers by Steven Earle is licensed under a Creative Commons Attribution 4.0 International License, except where otherwise noted.